Replica of an F.H.Ayres rocking horse on a bow. 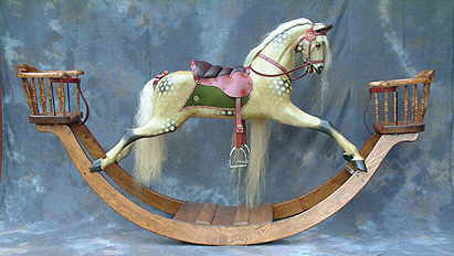 A replica of an F H Ayres rocking horse on a bow, available with or without chairs. An elegant rocking horse, carved, dappled and tacked up in the original style of F H Ayres horses.